Online ticketing platforms such as Bookmyshow.com and Paytm Movies are riding the Baahubali wave. Sensing the excitement of the fans, both the sites are offering huge discounts on the movie tickets of Baahubali 2. Online ticketing platforms such as Bookmyshow.com and Paytm Movies are riding the Baahubali wave. Sensing the excitement of the fans, both the sites are offering huge discounts on the movie tickets of Baahubali 2. BookMyShow today announced that it has sold over 3.3 million tickets so far with 12 tickets every second for one of the most anticipated movies of the year- Baahubali 2: The Conclusion. It surpasses Baahubali 1 by over 350%. The sequel to blockbuster Baahubali: The Beginning has broken the record for the fastest online pre-booking of tickets beating Aamir Khan's movie Dangal. Bookmyshow is offering a discount of up to Rs 125 upon using the promo code BMS125 on the purchase of two tickets, while Paytm users can avail flat Rs 100 cashback on a minimum booking of two tickets on using the promo code BAAHUBALI. The advance booking for SS Rajamouli's epic Baahubali 2 started in Chennai City and other parts of Tamil Nadu in the wee hours of 26 April. However, the booking sites of almost all multiplex players reportedly crashed within a few minutes after it opened. The magnum opus will be released in about 9,000 screens worldwide. India alone has 6,500 screens, while 1,100 screens have been allotted for the film in the US. The film will release in 1,400 screens in other parts of the world. Director SS Rajamouli has been working on this project for five years now. The prequel, Baahubali: The Beginning, was released in 2015 and it turned out to be a massive hit. Its collection of Rs 6500 crore at the box office set a new record in the Indian film industry. Trade analysts have predicted that the movie will outdo its prequel Bahubali - The Beginning and rake in around Rs 1,000 crore at the box-office. ALSO READ: 'Baahubali 2- The Conclusion' trailer out; gets over 4 million YouTube views in just 7 hours! The epic period flick has a bevy of stars in the cast including Prabhas, Rana Daggubati, Anushka, Sathyaraj, Tammannah, Ramya Krishnan and Nasser. Baahubali: The Conclusion is due to hit the marquee on Friday, April 28, worldwide. 1. The climax of Bahubali 2 or Bahubali: The Conclusion alone has reportedly costs a whopping Rs 30 crore, which is almost double the budget of the climax shot of its prequel Bahubali: The Beginning. 2. Television channel Sony TV has bought the satellite rights of the Hindi version of Bahubali 2 for Rs 51 crore, which is the highest amount paid for a dubbed film so far. It is also the highest price the channel has paid for a regional film for television screening. 3. Bahubali 2 is close to set yet another record of receiving the highest ever advance booking on BookMyShow, breaking the record that Dangal holds as of now. 4. Bahubali 2 or Baahubali: The Conclusion is believed to have already earned Rs 500 crore via satellite and theatrical rights even before its release. 5.Initially, both parts were jointly produced on a budget of Rs 250 crore however, the budget of the second part was increased later. 6. For the second part of the movie, Prabhas weighed 150 kg, which is 30 kg more than what he weighed in the first part. Fot that the makers of the movie shipped gym equipments worth Rs. 1.5 crore to his place. 7. The movie will get a massive release which no other Indian film has ever got in the past. It is going to hit about 6,500 screens across the nation, the highest ever for any movie in India. 8. Baahubali: The Beginning went on to become the highest grossing Indian film ever by earning an unthinkable sum of over Rs 650 crore. 9. 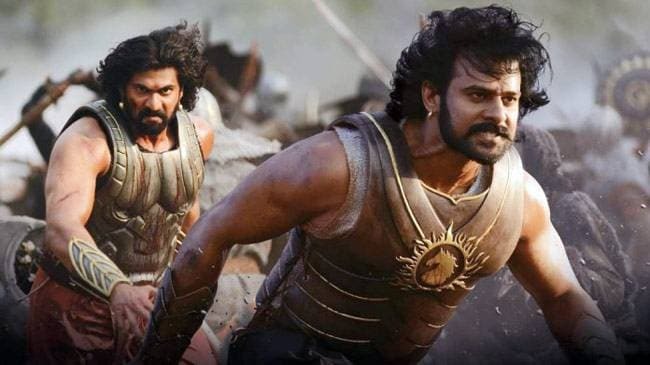 In a bid to meet the deadline of the film's release on April 28, the team of Baahubali - The Conclusion has apparently employed 33 VFX firms across the world. The film's VFX supervisor, R.C. Kamalakannan revealed the same on social media. 10. The film will be released in conventional 2D as well as in IMAX format on 28 April 2017, in India and in several other countries. When Bahubali: The Beginning had released, the first thing that fascinated everyone was its visual effects. Now imagine watching it in 4K High Definition format.